If we don't have a journal online, you must use the Library Catalog to determine if we have a journal in print or on microfilm. If you know the exact title of the journal, it is often easiest to use the Begins With search option in the Catalog, which will allow you to browse publications by title. 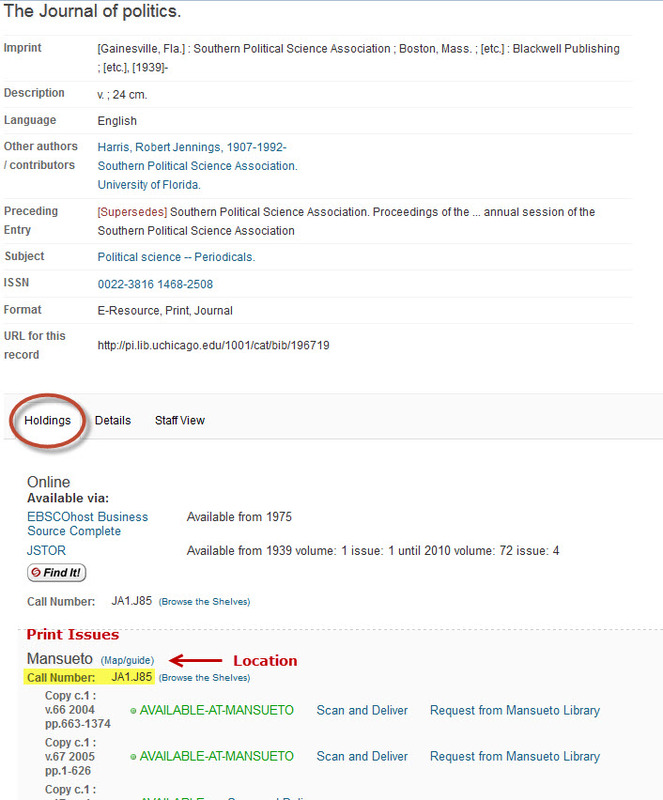 Do not include initial articles when entering your search (Journal of Politics not The Journal of Politics). If you are not sure of the title, use the basic keyword search, selecting "Journal" to limit your results. After conducitng your search, you may notice multiple catalog records for each publication title. These records are usually for online copies. It may require a few clicks to locate the record with the print holdings. If you need assistance locating the correct record ask a librarian. The brief record for the print journal should include a location, call number, and availability. Print journals may be in multiple locations. Click on the title to view the full record with details about where to find the journal in the Library. Once you open the full record, go to the Holdings tab at the bottom to determine which issues of the publication are available and where they are located. Most back issues in print will be housed in the Mansueto Library. Recent print issues are usually online or available in the current periodicals section of the Library. Publications on microfilm will have very similar catalog records, and most are housed in the Microforms Collection on the 3rd floor of Regenstein.